YES PEOPLE. It’s that time of year. BRONZE GODDESS TIME. Always a highlight of the beauty calendar for me and a true signal that yes, Summer really is on it’s way. The collection has some annual staples – the fragrance that is Summer in a bottle, a highlighter of sorts, a palette and some bronzing goodies. After all, it wouldn’t be right to have a Bronze Goddess 2016 Collection without some sort of bronzing goodies?! The collection bits I have here to show you include – the beautiful fragrance. The matching scented shimmering body oil. The Summer Glow Eyeshadow Palette and the Multi Palette with a trio of cheek shades for bronze, glow and highlight. Then there’s also the Gelee Bronzer and (not shown) the Summer Glow Illuminator. But that will be popping up in another glow-giving post very soon. 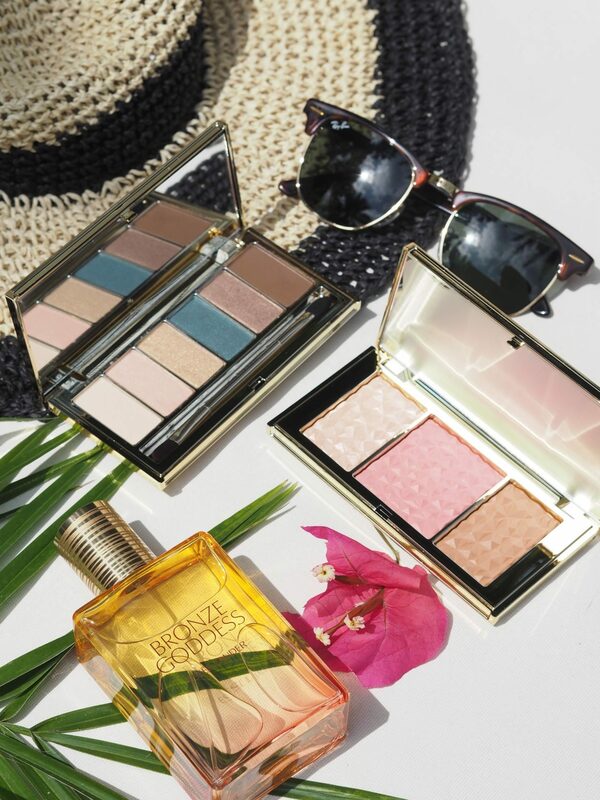 The thing I adore about the Bronze Goddess collection each year is how it brings together the most perfect Summer shades of bronze and neutrals and combines with with that pop of pool-side turquoise. All topped off with a fragrance that just screams LIE ON THE BEACH AND SOAK UP THE SUN. 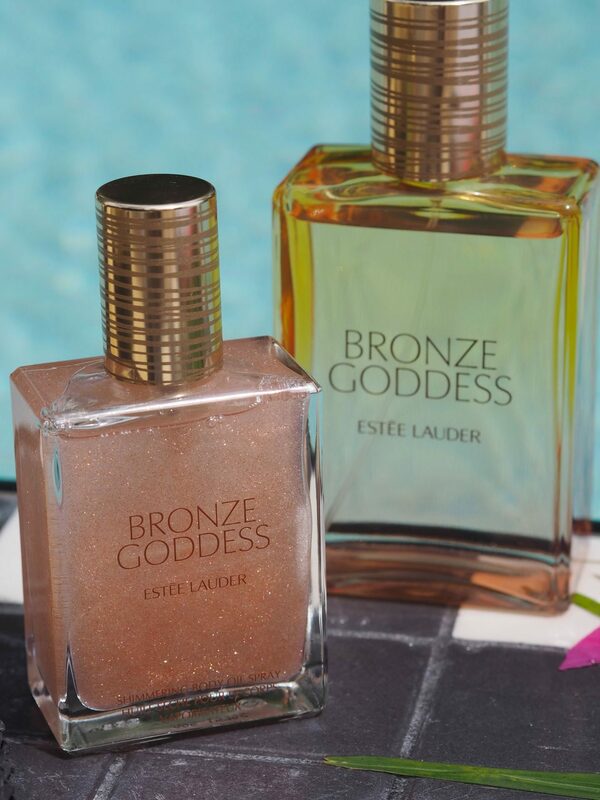 Seriously, if you haven’t yet experienced the beauty that is Bronze Goddess fragrance you need to do your nose a favour and hot step it over to your nearest counter and give it a whiff. The best way I find to describe it, is like the smell of a beach towel drying in the sun, blended with a bit of sun cream. It’s technical description is a mix of citrus with Sicilian berhamot, mandarin, lemon and orange head notes. Heart notes of tiare flower, jasmine, magnolia and orange blossom. With a base of amber, coconut milk, vanilla, vetiver, sandalwood and myrrh. It’s a beauty and I challenge you to find a more perfect Summer scent. It just can’t be done. The star of the show make-up pieces wise for Bronze Goddess 2016 has to be the cheek trio. Anyhting offering a bronze/glow/highlight trio is going to catch my eye and these shades are just beautiful. These are the texture that Estee Lauder often includes in it’s Bronze Goddess offering where it’s a cream/powder type of texture. Not quite a powder but not quite a cream. Meaning it applies like a dream and is perfect if you want to maybe have a little glow when you are by the pool as it lasts better than a powder would on the skin. It gives that glowy sheen you want on holiday that’s not too heavy or ‘done’. This was a go to for me on nights in Miami recently. I’m doing a bit of a ‘best of Summer collections’ round up and you can bet your bottom dollar that there will be a piece or two from this gorgeous bunch in there. I’m also thinking of doing a beauty tutorial with this collection. Let me know if that’s something you would be keen to see either on here on on my You Tube channel and I’ll get right on it. But until then. HELLO SUMMER TIME! I agree: the Estée Lauder Bronze Goddess limited collection always feels extra-special, and I’m always looking forward to discover it! The cheek trio is absolutely gorgeous! Great Post! Now Summer is here it is great to start adding a bronze palette to our make-up regime!